With so many varieties of wood species available, positive identification of wood by grain pattern alone can be difficult. To the untrained eye, grain patterns aren't typically consistent enough to distinguish similar species from one another. However, a handful of species commonly used in the building and woodworking industry have familiar grain patterns that can be recognized on sight. 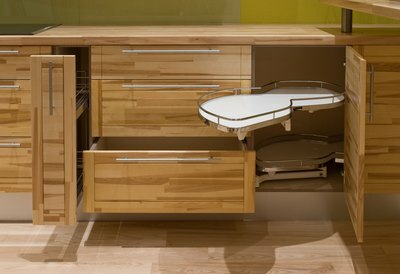 With the exception of maple, which has a slick surface, common hardwoods, such as ash, oak, hickory and alder, typically have a porous texture or small indentations or relief patterns that follow the grain. 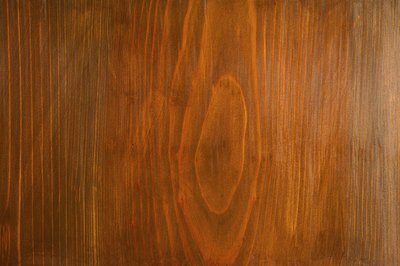 Common softwoods, such as pine, fir, spruce or poplar, have closed pores, resulting in a slick, flat surface without indentations. Other differences between hardwoods and softwoods include the presence or lack of grain. Hardwood typically has bold grain lines with contrasting color between them. Softwoods typically appear to have little or no grain patterns at all. If grain is visible, the color of the wood between the grain lines is similar to the grain pattern, with little or no contrasting color between the lines. Check the color before examining it for patterns. 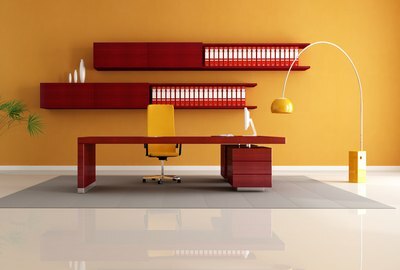 Most wood is amber or off-white in color. Ash, oak, maple and hickory are some of the most common hardwood examples that are lighter in color. 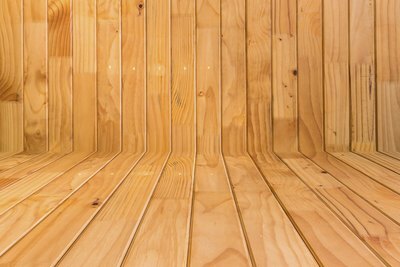 Pine, spruce, fir and poplar are a few of the most common softwood examples that are light in color. 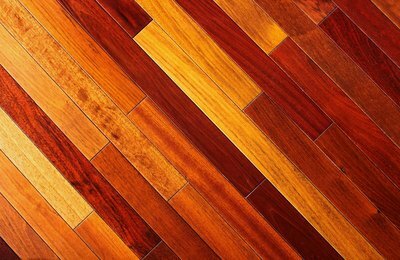 If the color is consistently brownish, chocolate or a combination of brown and red, it's likely to be a hardwood species such as alder, mahogany, cherry or walnut. Softwoods typically do not have dark representatives. Other deciding differences reside in grain lines themselves. Hardwood grain lines appear dark brown to black. Softwood grain lines typically appear tan, amber or yellow. Look for brown, broad grain lines with a flame pattern to identify oak. Ash wood may show a similar pattern, but with more complex grain lines that come to a sharp point. Hickory typically forms consistently straight, close grain lines with few curves. Maple grain has broad patterns of differing colors, with fewer sharp edges than oak or ash. Maple may also form translucent waves running across the grain. Among the darker hardwoods, cherry appears with flecks of grain or pockets of black scattered through the pattern. Mahogany's grain lines are consistently straight and subtle -- almost indistinguishable. Alder has light grain lines that wander with little or no definition. Walnut is easily recognized by its color alone; its pattern is typically curvy with relatively few variations. Grain patterns often break the rules, contradicting common perceptions. Look for consistency to identify grain patterns with some degree of accuracy. Softwood grain patterns are not scrutinized as closely as hardwood patterns. 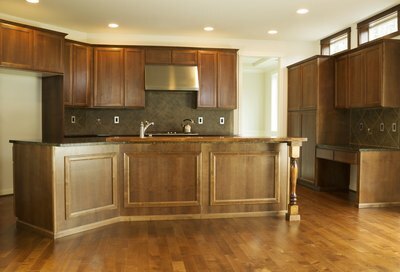 Softwoods are not used as often for fine furniture or cabinets but are a mainstay in the molding industry as paint-grade material. Fir, poplar and spruce all have relatively straight grain. 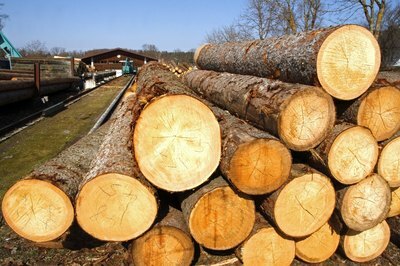 Pine is the exception: Pine lumber, depending on grade, can be full of knots, swirls and defects. Also known as knotty pine, lumber with these characteristics is sought out as aesthetically pleasing. Fir and poplar, although typically not subject to grain comparisons, are often used for trim work because straight grain patterns add strength and resiliency. Three types of grain patterns typify all wood species: face-grain, end-grain and side-grain. Face-grain is exactly what it seems: the flat surface of the board. Face-grain has the most complex patterns. In most instances face-grain patterns are broad, widely spaced, and run perpendicular with the length of the board. End-grain is exactly what it sounds like, the end of the board. It has holes -- which are the pores that nourish the wood when it's alive. Side-grain is also what you might imagine; the side of the board. Side-grain lines are almost always straight and closely spaced. Nothing is written in stone. Grain identification by grain lines is subject to differing grades of lumber, where it's grown, defects and other variables that can make exceptions to every rule. Combine your observations of grain patterns with density, weight, color and other subtle differences to get closer to identifying a particular piece of wood. How Can You Identify Different Wood Types?